The December Greater Atlanta Coin Show visitors experienced a colder day outside but a busy bourse filled with numismatics and collectibles in the hotel's Hamilton's restaurant. In somewhat of a maze, the dealers filled the restaurant bourse with their many displays of coins - ancient to modern, currency - inactive to active, bullion - silver to gold to platinum, and many other collectibles as well. Lots of visitors came to browse, buy, sell and trade at the last show of the 2016 year. Thank all of you - from the visitors to the dealers to security to the hotel's staff - for a busy December coin show and the busy shows for the early months of the year as well. And, before we forget, we wish each and every one of you a Merry Christmas and a Happy Holiday season. And may the new year be filled with good health and prosperity for you all. For the Sunday show, the weather chose to be cold, more in keeping with December in the metro Atlanta area with clouds most of the day and some weak sunlight late. The hotel was busy with a variety of gatherings and holiday celebrations. 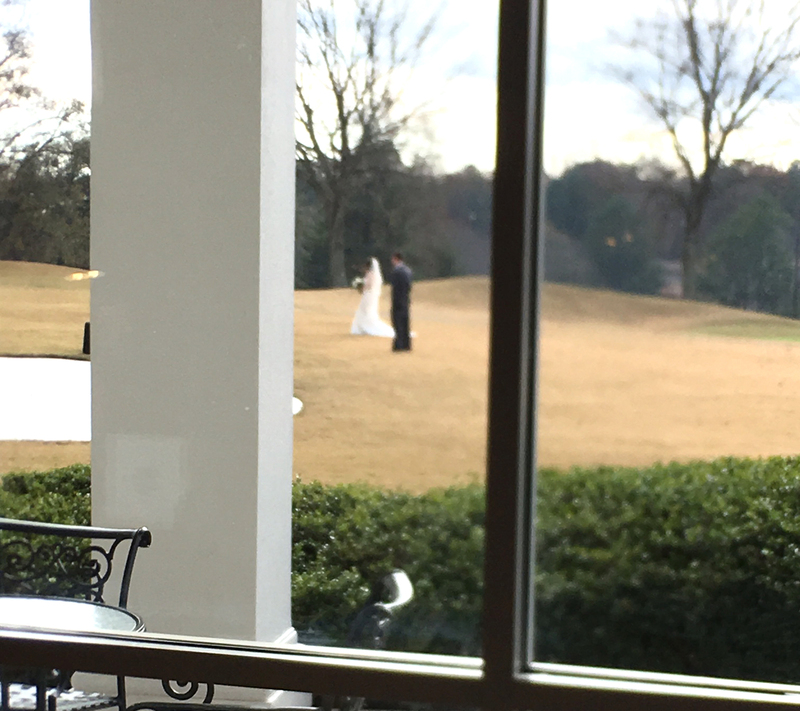 Being the restaurant with windows overlooking the golf course, people on the bourse witnessed a couple in their wedding finery being photographed. It was a cold day for outdoor wedding photos. The photographer may have to photoshop the images to remove the cold, blue skin tones. Later in the day, the ballroom where the show normally occurs was being outfitted for a Home Depot Christmas party. We hope they had a good time and found something useful in the black and orange goody bags displayed on the tables. Those five coins, each one an outstanding example, complete our highlight tour for this month. We wish for you and yours a safe and happy holiday season and good health and prosperity in the new year. In January, the dealers of the Greater Atlanta Coin Show will pack the bourse with their displays of coins, currency, bullion and other numismatic items along with other types of collectibles, too. Mark your calendars to visit the first Greater Atlanta Coin Show of the new year on Sunday, January 15, 2017. On a sad note, we displayed a couple of In Memoriam photographs of a dealer that set up at many of the Greater Atlanta Coin Shows through the years. 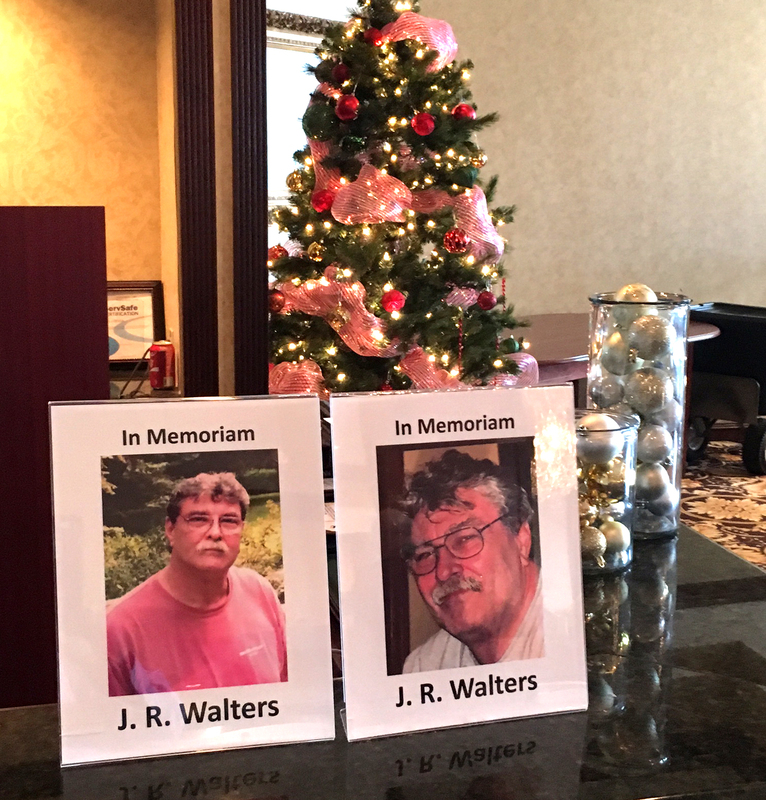 After a long illness, J. R. Walters passed just before the Thanksgiving holiday. Though he hadn't set up at the monthly show for the last few years, he did showcase his numismatics each month for the first 25+ years. Godspeed and may he rest in peace. The coin show enjoyed lots of visitors and many of them were new to the show - welcome and we're glad you came. A lot of the visitors searched for bullion, whether for gifts for others or for themselves. At the end of the day, the dealers had sold out of bullion. But, the dealers always display interesting numismatics for those visitors looking for coins to add to or upgrade their collection. Let's take a look at a few of the examples on the December bourse. 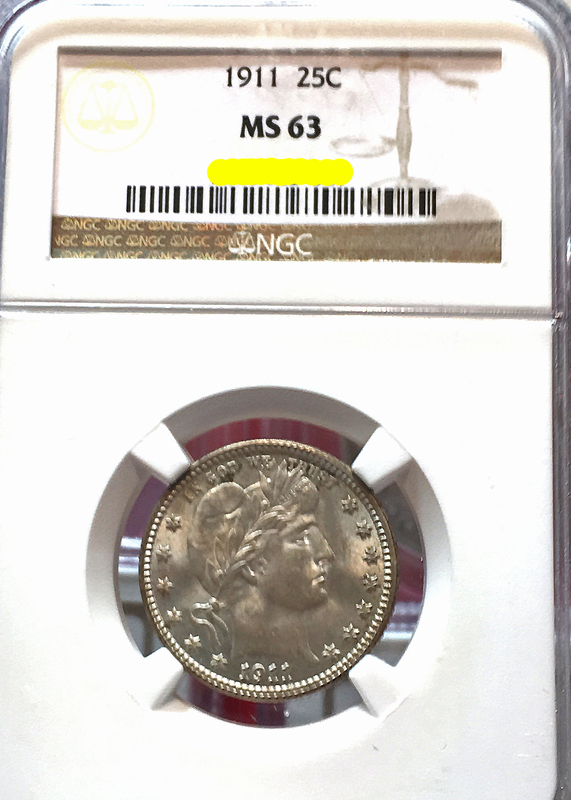 The first coin is an 1877 Trade Dollar certified MS-61 by NGC (Numismatic Guaranty Corporation). Per the Red Book, "the US Mint issued trade dollars in Asia to compete with dollar-sized coins of other countries. They were legal tender in the United States, but when silver prices declined, Congress repealed the provision and authorized the Treasury to limit coinage to export demand." Throughout Asia, people would stamp Oriental characters on the coins called chop marks. The ANA Grading Guide states that the chop marks do not alter the grade, however they must be communicated when present. For the trade dollars, the ANA Guide advises the "bag abrasions and scuffmarks are considered different from circulation wear. Full mint luster and lack of any wear are necessary to distinguish between Mint State and About Uncirculated." At MS-61, perhaps this coin is not as traveled as its lesser quality counterparts, but oh the tales it could tell. 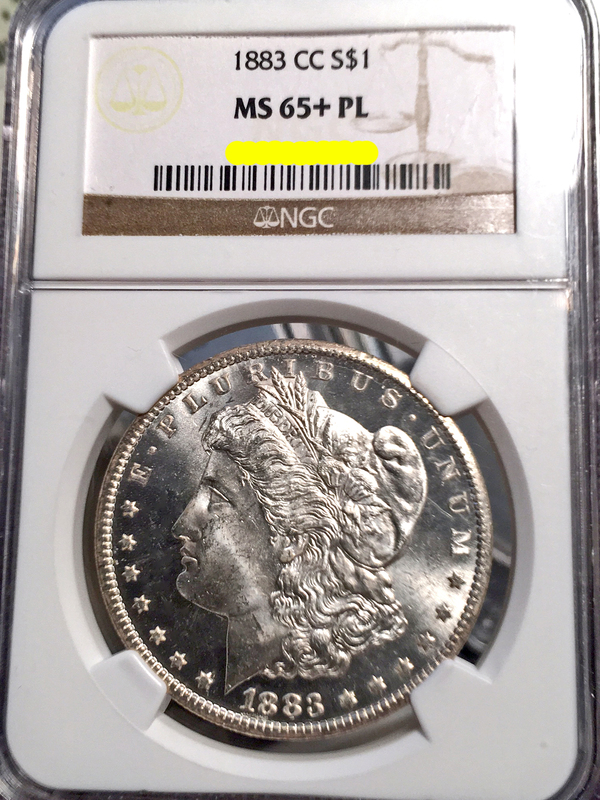 Next on our list is an 1879 Morgan dollar minted in San Francisco and certified MS-67 by NGC. In the second year of the Morgan dollars, the US Mint produced of 27.5 million of the 1879 coins at the Philadelphia, Carson City, New Orleans and San Francisco locations. San Francisco struck over 9 million of the coins or roughly 33 percent. At MS-67, this coin is not quite perfect per the grading standards, but it is close. The ANA Grading Guide states the MS-67 Morgan dollar is "Virtually flawless but with very minor imperfections." In general, the Guide describes the MS-67: "Has original luster and normal strike for the date and mint. May have three or four very small contact marks and one more noticeable but not detracting mark. On comparable coins, one or two small single hairlines may show, or one or two minor scuff marks or flaws may be present. Eye appeal is above average." One grading service claimed that it is easy to find the 1879-S Morgan dollar in the higher certified grades. That is probably an opinion not necessarily experienced in the world of coin dealers and coin shows. Regardless, this coin is a very nice example of the almost flawless Morgan dollar. Our next coin is another Morgan dated 1883 and minted in Carson City. NGC certified this coin as MS-65+ PL or stated another way, a mint state coin at better than a 65 grade that is also proof-like. First, the ANA Guide describes the MS-65 Morgan: "No trace of wear; nearly as perfect as the MS-67 except for a few additional minute bag marks or surface mars. Has full mint luster but may be unevenly toned. Any unusual striking traits must be described." In 1883, the US Mint produced not quite 28.5 million of the Morgan dollars with Carson City striking just over four percent of the coins. The US Mint's Philadelphia location struck the proof coins. For this coin, the PL after the grade denotes proof-like or "an uncirculated coin with a mirrorlike reflective surface but lacking the full characteristics of a Proof." This coin is another fine example showcasing George Morgan's design of Liberty. 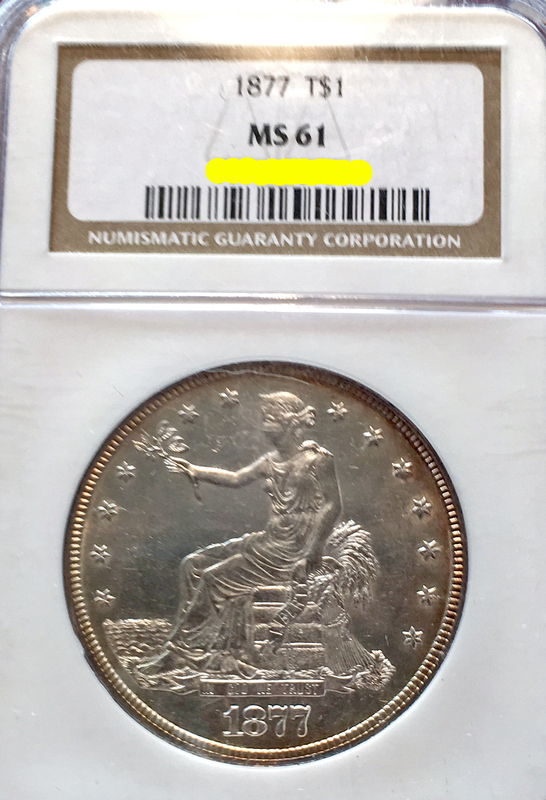 Changing centuries and denominations, the next coin is a 1911 Liberty Head or Barber quarter certified as MS-63 by NGC. For the Barber quarter, the ANA Grading Guide describes the MS-63 as "A Mint State coin with attractive mint luster, but noticeable detracting contact marks or minor blemishes." The US Mint produced the Liberty Head quarter coin designed by Charles E. Barber from 1892 to 1916. In 1911, their Philadelphia, Denver, and San Francisco locations delivered over 5.6 million of the twenty-five cent coins. This example is one of the over 3.7 million coins produced by the Philadelphia mint. As a result of the production inequality, this coin is not as valuable as its cousins from the Denver and San Francisco locations. But as a highly graded coin, this is a very nice Barber quarter specimen. 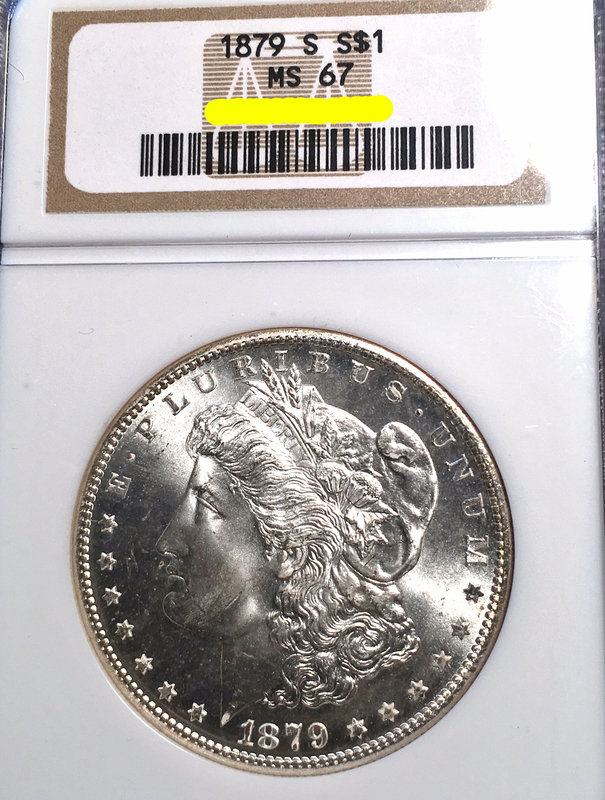 The last coin in our highlights for the December show is a 1912 Liberty Head or Barber half dollar. Also designed by Charles E. Barber, the US Mint made this coin from 1892 to 1915. 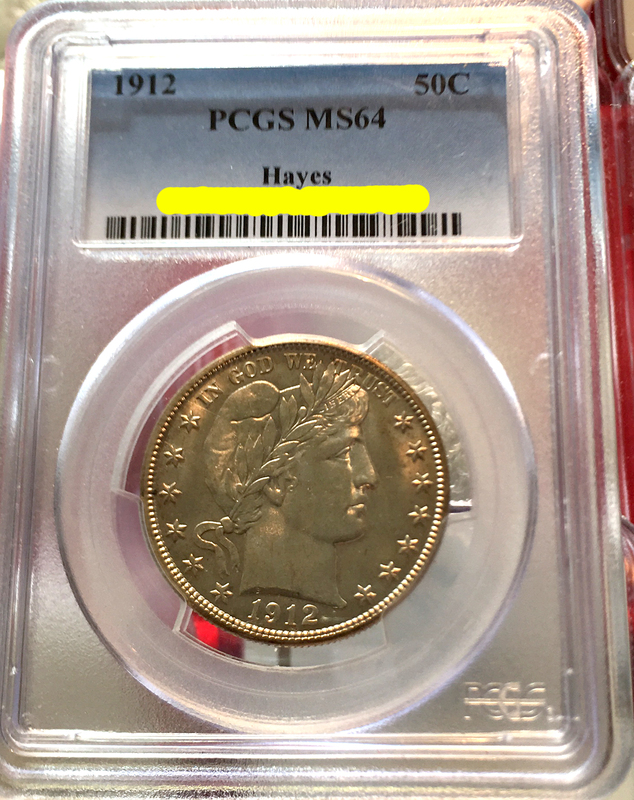 PCGS (Professional Coin Grading Service) certified this coin as MS-64 and designated it a Hayes. The coin was part of a PCGS Registry Set in the group they specify as Barber Half Dollars With Major Varieties, Circulation Strikes (1892-1915). Per PCGS, this designated group requires 74 coins to be complete. This particular coin belonged to the registry set titled Michael F. Hayes - Elbesaar Collection, which was 100% complete with all 74 coins. At one time the Elbesaar set ranked 7th in its designated registry group. "This is a very common issue below Gem condition, and it is one of the most common mint state issues of the entire series. However, for some unknown reason, Gems are surprisingly scarce. In fact, with the exception of the ultra-low mintage 1914, the 1912 is the rarest Philadelphia Mint issue in Gem condition from 1906-1915. This is an issue that almost no one thinks of as being anything special because of the ready availability of lower grade specimens, but just try and find a Gem..."
Side note: the ANA Grading Guide explains "within the Mint State category some numismatists use adjectives such as typical, select, choice and gem to describe increasing levels of quality, with typical being MS-60 or so, choice MS-63 or MS-64, and gem MS-65 or higher." This 1912 Barber half dollar coin may only be "choice," but it is still a very nice selection.